2017 was a crazy year for GPS tracking and fleet management. Last year, fleets saw logbook mandates, electric trucks, and anything in between! 2018 also promises to be an exciting year. 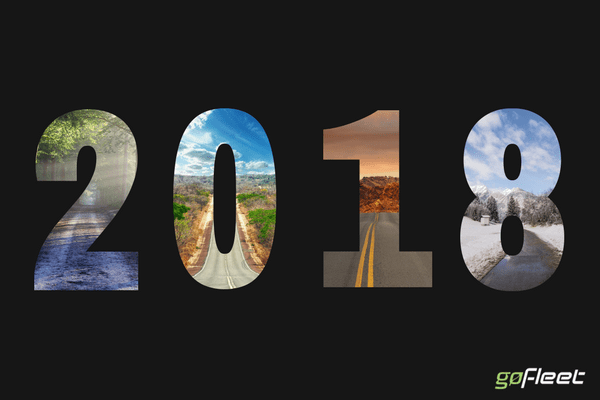 Here are some of the best GPS tracking and fleet management trends to follow in 2018! Marijuana will be legal in Canada starting July 2018. One of the concerns, however, was preventing impaired driving. As such, impaired testing apps are gaining interest. For instance, engineers created apps like Good2Drive to test driver alertness at the start of the trip. Cameras are one of the fastest growing safety gadgets. Vehicle fleets and individual drivers are both seeing the value of dashcams. Because of dashcams, drivers are capturing accidents and successfully defending themselves against false claims. Another big newsmaker is distracted driving. Thankfully, the public is much more aware about the dangers of distracted driving. This concern is also reflected by businesses – many fleets created strict policies against texting and driving. Self driving cars continue to appear on the news. Last year, the FMCSA had a public hearing about the future of self driving cars. In addition to the hearing, another big step was the Tesla Semis conference. These trucks are electric and are able to self-drive on highways. Several companies have already publically pre-ordered up over 100 trucks! Although the trucks might not yet hit the road, the market is definitely there. Nonetheless, we can expect further debate and policies in 2018 around self driving trucks. Cybercrime is another thing to look for after an eventful 2017. 2017 was indeed a big year for cybercrime, where businesses and even governments were hacked. Cyber criminals can also target GPS and fleet management systems. These systems contain treasure boxes of data. Hackers can access sensitive data and can even control vehicles in some systems! How can fleets prevent cybercrime? The best GPS systems have strong cyber security systems. For instance, Geotab includes security in their company culture. Their system has many levels of protection, including encrypted data, secure cloud storage, and controlled firmware updates. Driver recruiting and engagement remains an industry challenge. Older drivers are retiring and that is causing a driver shortage. In order to adapt to a changing workforce, driver recruiters are using creative techniques. One company used social media to attract new young drivers. They shared pictures of community events, driver birthdays, and driver awards. This resulted in thousands of followers and regular job inquiry messages on social media. For a long time, GPS tracking meant just looking at vehicle location. Only a few years ago, many businesses were resistant to GPS tracking. Fast forward a few years and that attitude has now changed. Fleets are not only buying into GPS tracking but are also asking for more data! The best GPS tracking services have driver, fuel, and diagnostic reports. Customers are starting to realize this. 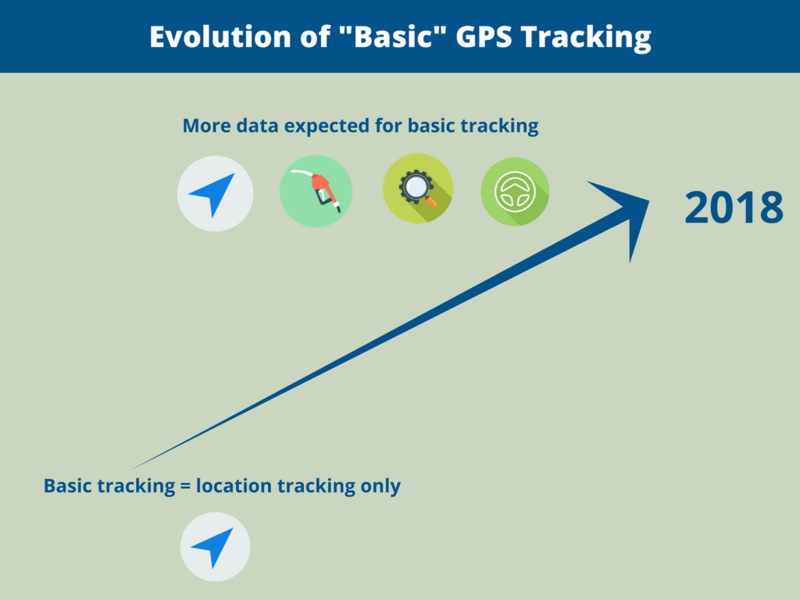 In 2016 and in the early parts of 2017, purchasers often ask for “basic location tracking”. As the year progressed, purchasers were asking for more reports. In 2018, we expect fleets to collect and measure even more data. 2017 was a big year for rules. Many businesses revamped their logbook policies in order to get into compliance with the ELD rules. Canadian ELD mandate. Transport Canada is drafting its own version of the ELD mandate. It’s expected to be similar to the American rules and should be released shortly. Food Safety Modernization Act (FSMA). Food carriers are required to keep storage reports. Companies are using temperature monitoring systems to report and alert temperature changes. 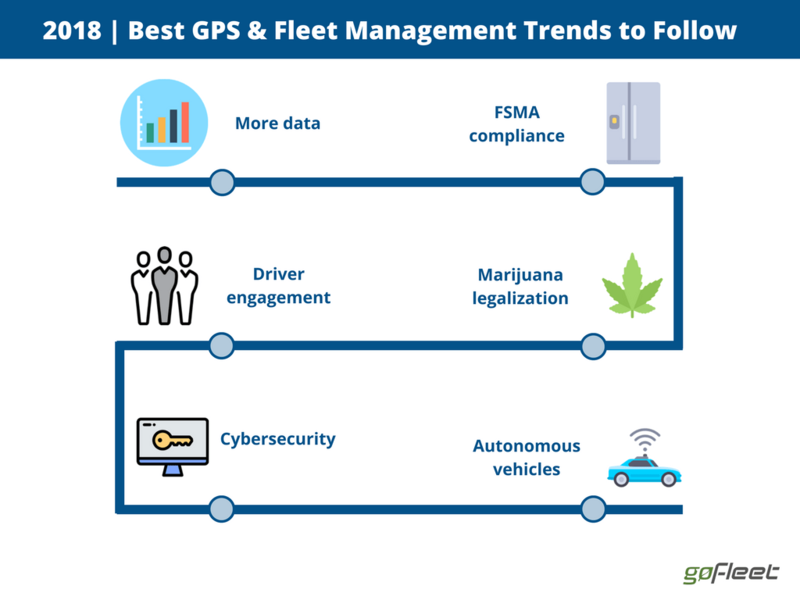 Enjoyed our list on 2018’s best GPS tracking & fleet management trends? Sign up to our newsletter to receive regular industry updates!